Dannii Minogue’s label is now a Royal hit after Pippa Middleton chose to wear this ‘PHOEBE’ peplum dress to the Wimbledon final last weekend. Princess Mary of Denmark was also seen in the same bluebird-print, peplum-waisted dress just two months earlier, at the christening of baby Princess Athena. Project D, by Dannii and business partner Tabitha Somerset-Webb is sold at a relatively accessible price point (this dress retails at £350) and the brand looks set to become even more in demand, as fans already include Holly Willoughby, Amanda Holden, Kelly Brook and Christine Bleakley. This Phoebe design from the spring/summer 2012 collection is sold out almost everywhere now following Pippa’s seal of approval. 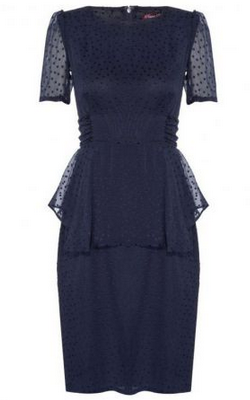 Luckily, Girl Meets Dress have the exact dress in the Navy Blue version, and you can wear it for just £59. Posted July 10th, 2012 in Uncategorized, Website News.